So, we had 2 weeks at Storrie Lake, then 6 days away at Villanueva State Park, then back to Storrie Lake for 14 days. I was thinking of a place to go next. Maybe a little north to Coyote Creek State Park? 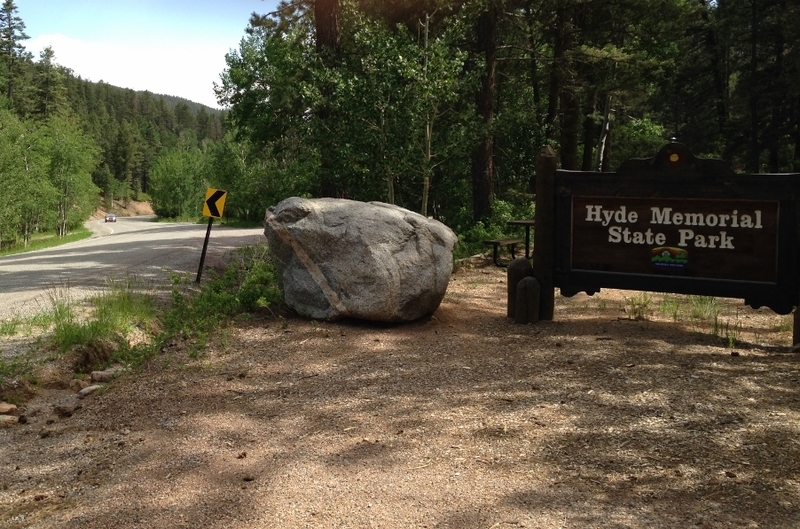 Maybe Hyde Memorial State Park in Santa Fe? 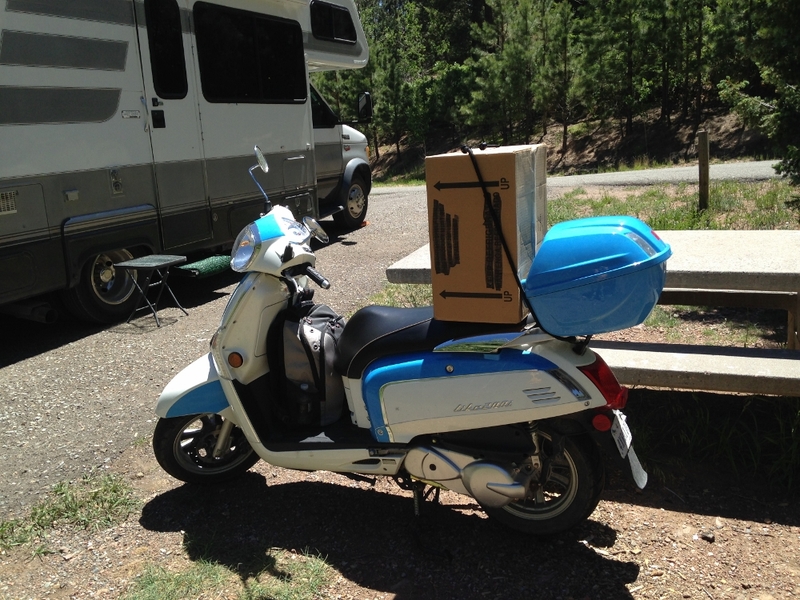 I realized I needed to get my next scheduled service done on the scooter, so Santa Fe it is! Centaur Scooters had closed in Feb. (the owners retired), but Mateo and Eddie had spun off the service shop just around the corner, so I made an appointment for June 10th. 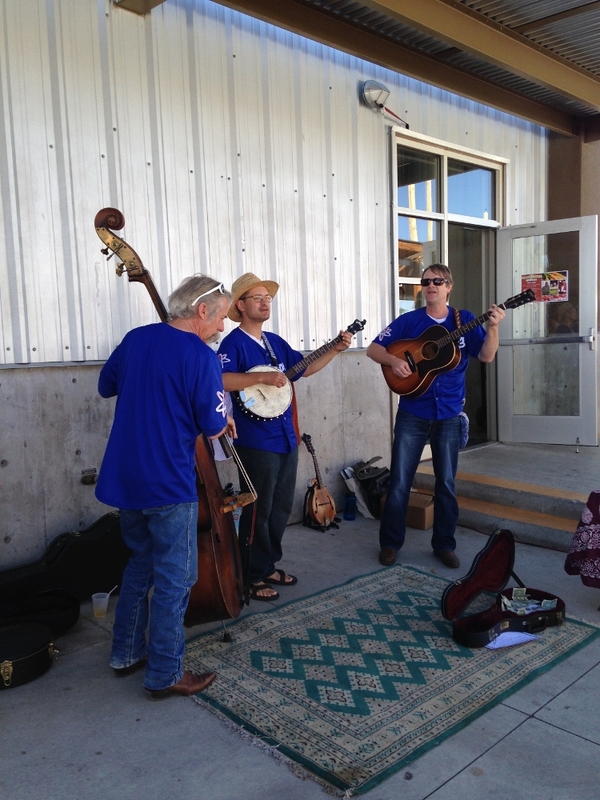 We had to leave Storrie on 6/9, so just headed to Santa Fe and planned an overnight at the new Walmart near I-25. First up when we got to town was a visit to Trader Joe’s to stock up on some goodies. The next morning we dropped off the scooter, then ran a few more errands. By noon we were loaded back up and headed up the mountain on the way to Hyde Memorial. The park sits at about 8,400 ft. elevation, so is nice and cool. 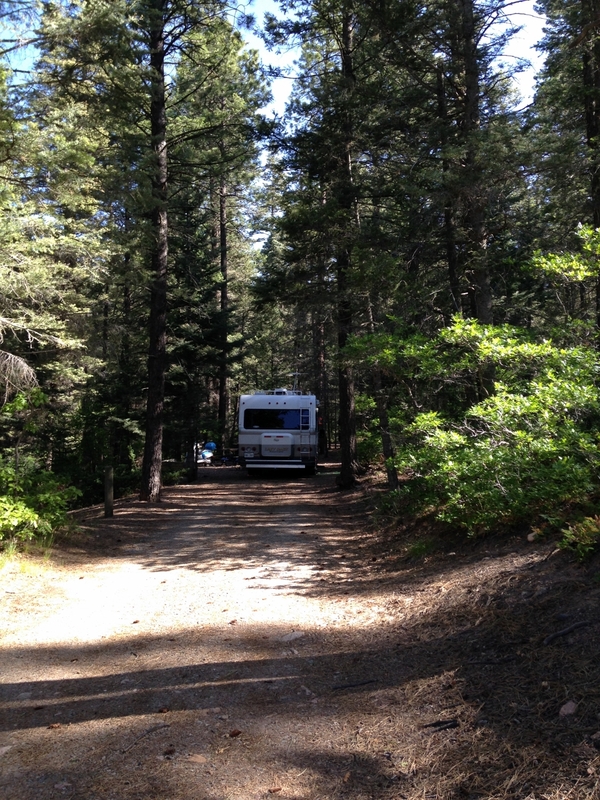 Hyde has about 8 RV sites with electric hookups lined up in a row right along the road. But, I hoped to get site 19, on the main camping road, in the forest. Chris and I stayed at #19 last June. It was long and level. 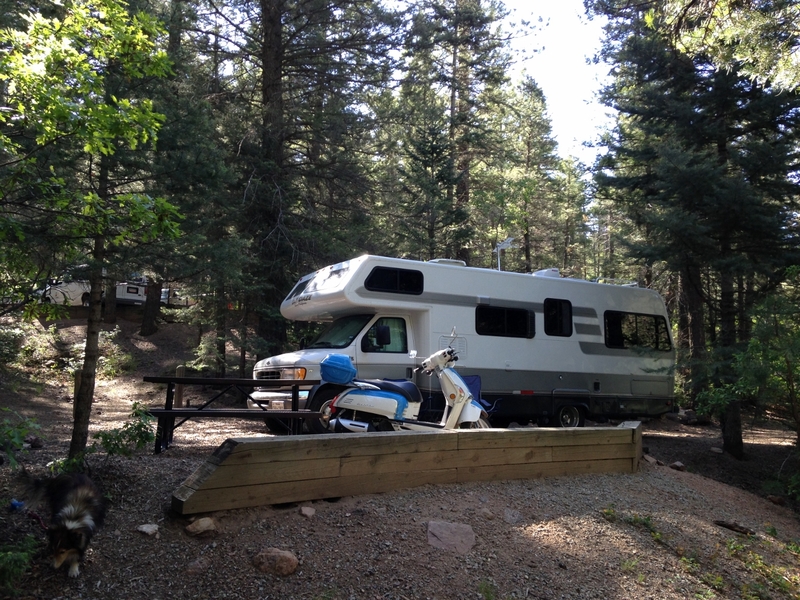 We were able to fit both of our RV’s plus Chris’ truck in the site. Luckily, it was available when we got there. 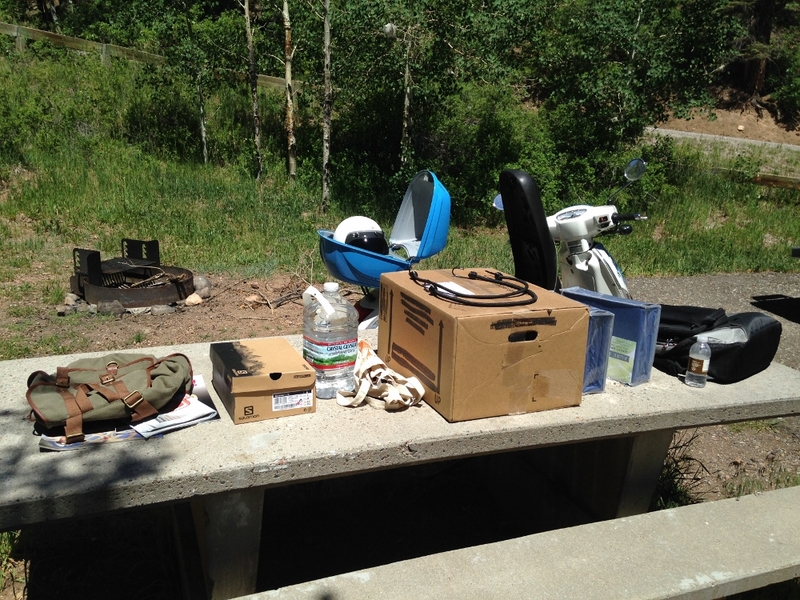 It’s a very shady site, but I parked so I got sun by about 11:00 AM, then had sun through the afternoon on my solar panels. Unfortunately, there were also bugs hitting my roof. Some little inchworm thingies would lower themselves off the trees via thin strands, so I would either walk into them on the trails, or they would drop on my RV. They were small enough to get in through the screens on my roof vents. Fun times. 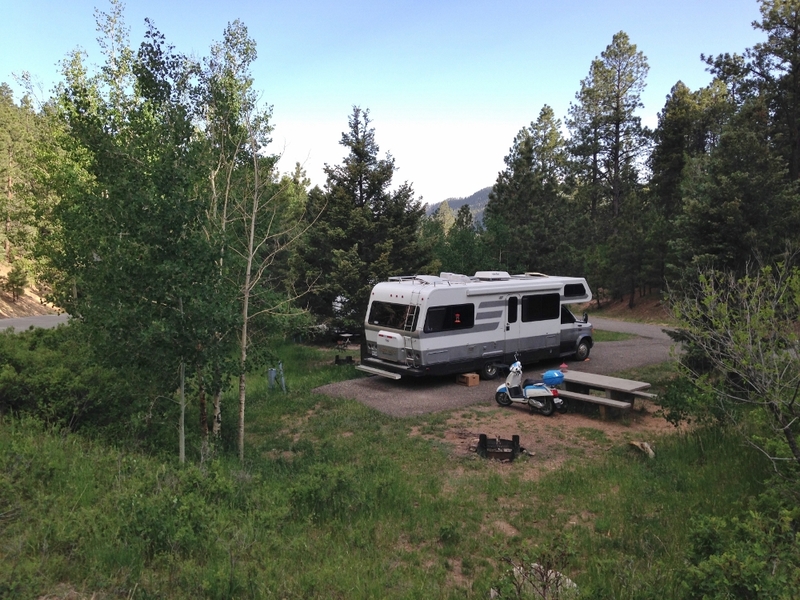 After a few days I moved to the RV/electric sites. They don’t have any trees overhanging the sites. Moved to site #38 in the RV row. Anyway, I already knew there was no internet connection at Hyde. 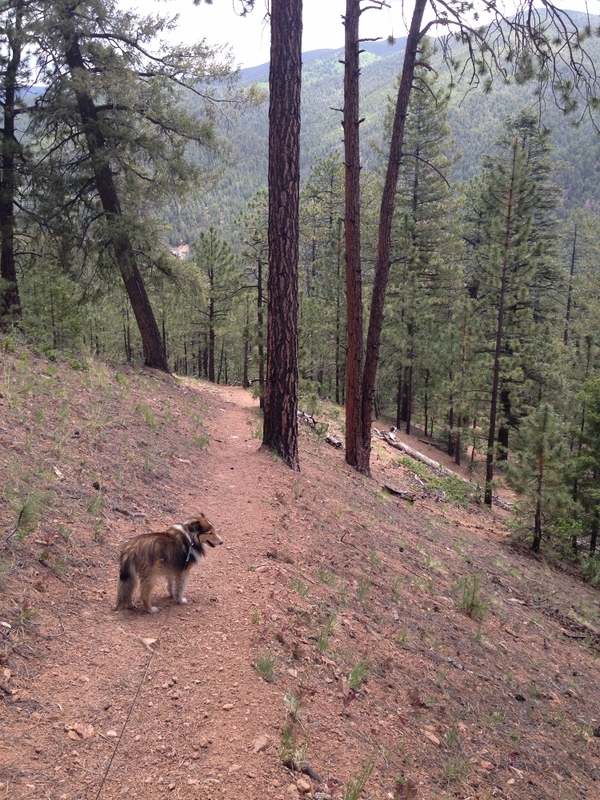 But, I figured Riley and I could hike the Circle Trail up to the ridge-line where there was Verizon signal. Or I could scoot into town and hang at a coffee shop. Every other day we did the hike and every other day I went in to Santa Fe. That worked out OK, although it’s always nicer to have connection whenever/wherever. The Circle Trail is a lovely forest hike, although moderately strenuous. 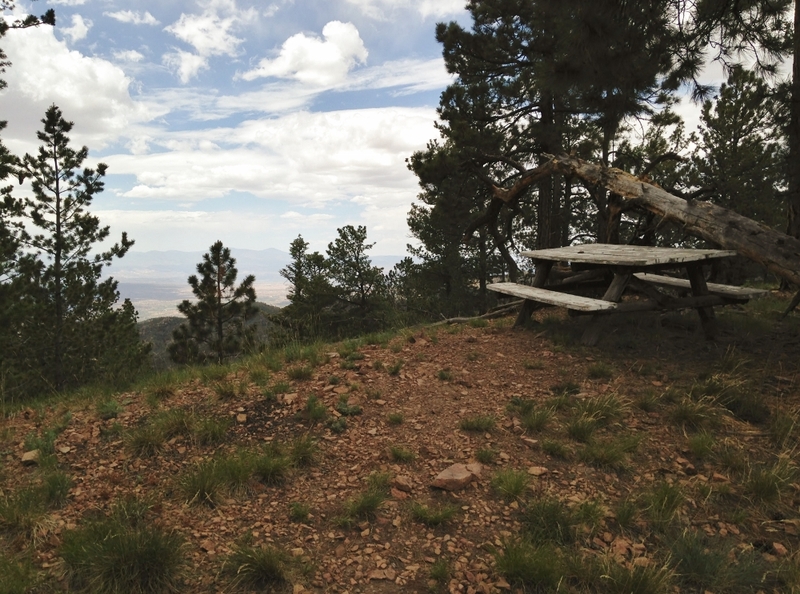 The section from the campground to the ridge is about a mile and gains 1,000 feet elevation. Riley and I both got better at it each time. About to head up the trail. 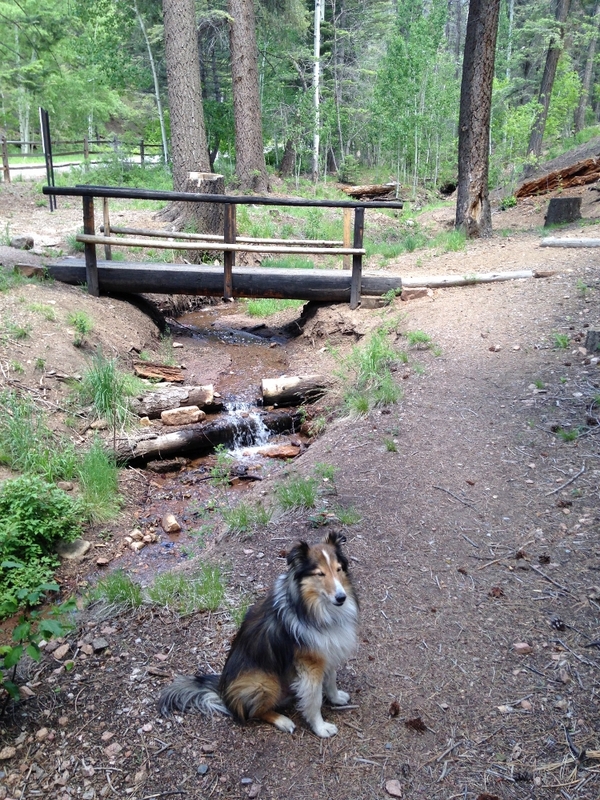 Little Tesuque creek runs through the campground and there are lots of little mini-waterfalls. There are 2 picnic tables at the top of the ridge. Plus you can see a LONG way from up there. 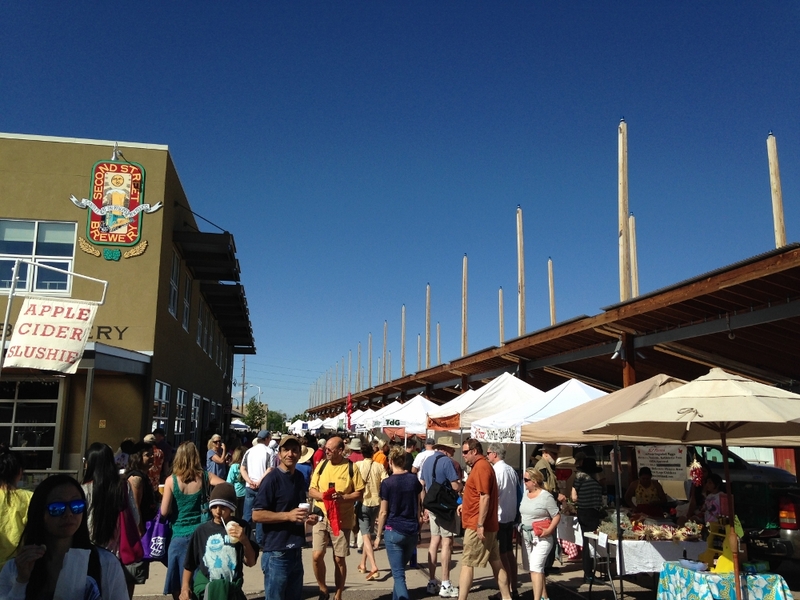 I rode in to Santa Fe on Saturday and got to take in the Farmer’s Market at the Railyard. 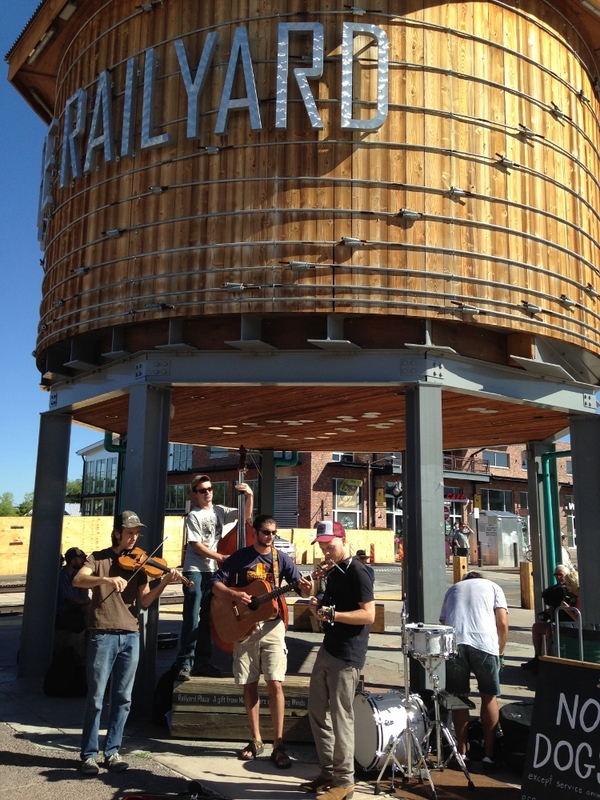 There was a good band playing at the entrance. Had to get a picture since they have an upright bass player (I used to play in high school). 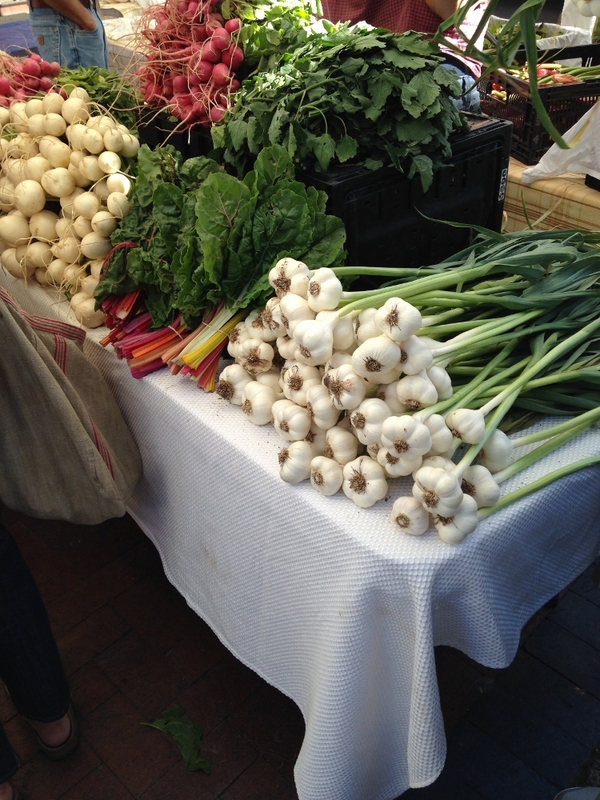 They have some GOOD looking produce at this market. On another day I rode the scooter in to town to run errands and get online. I picked up a new pair of hiking shoes at REI, 2 sets of jersey sheets to use to cover the couches, and refilled a gallon jug of water. Then I stopped at the post office to see if my package was in. Cliff, the former owner of my RV, found some couch bolster pillows and had sent them to me in Santa Fe. Can you believe I fit all this stuff on the the scooter? Canvas backpack, shoes, water, box of couch pillows, 2 sets of sheets and my laptop bag with iPad on top. Shoes and water in the top case at the back, box of pillows bungeed to the top case base, laptop bag on the floorboard (and hanging from a hook under the handlebars). Canvas backpack is under the seat, I didn’t need to use it. It scrunches up and lives there in case I need extra carrying ability. The scooter has been so handy. It’s fantastic to be able to scoot wherever I need to go. I only wish I could take Riley with me. It would be nice to take him places to go hiking. Maybe one day I will upgrade to towing a car. Maybe some day. We stayed 7 days at Hyde. I thought I would move back to Storrie, but didn’t want to get back too soon. 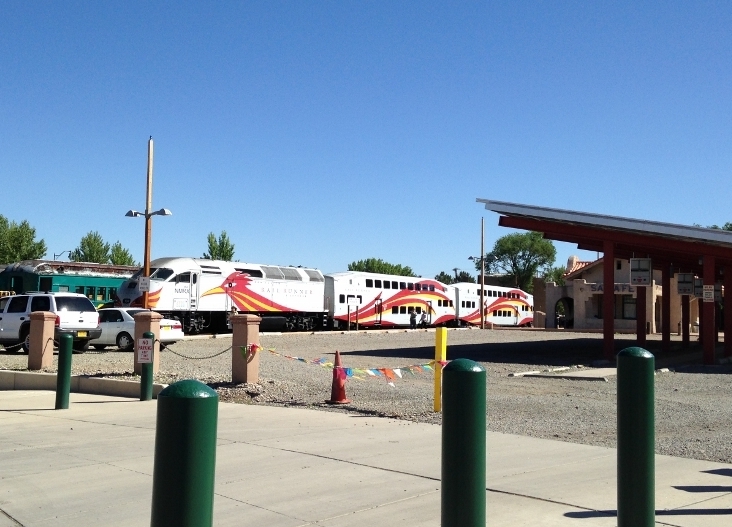 Las Vegas, NM has a big celebration over several days for July 4th. So, I wanted to get there closer to June 24th or so, so we could have our 14 days stretch past the 4th of July holiday. I had a standing invitation to visit with my friend Iska who lives in the country on the outskirts of Santa Fe. She is a longtime friend of Chris’s and I had met her a couple of times last year when he and I visited while in Santa Fe. I called and we arranged to head to Iska’s on the 17th. That’s next. 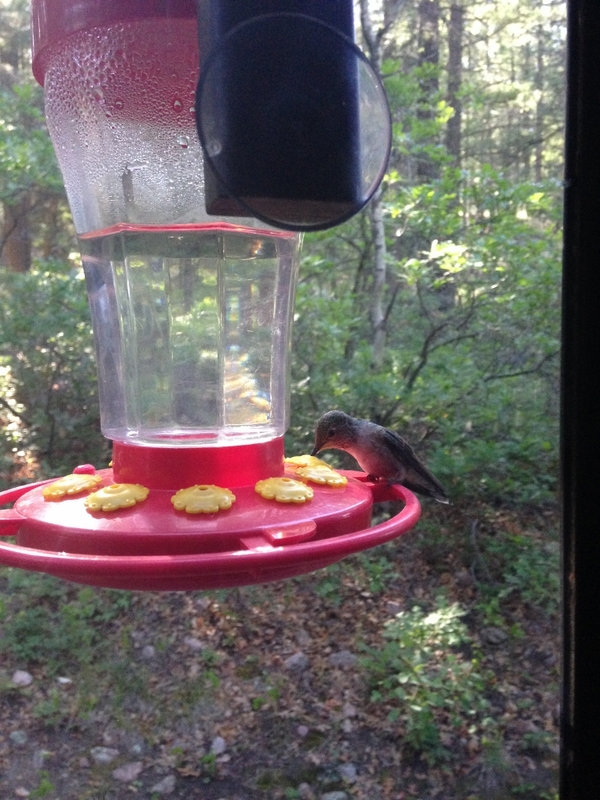 I will sign off with a hummingbird photo.